Poster’s Note: One of the many under-appreciated aspects of NASA is the extent to which it publishes quality science content for children and Ph.D.’s alike. NASA Space Place has been providing general audience articles for quite some time that are freely available for download and republishing. Your tax dollars help promote science! The following article was provided for reprinting in December, 2012. 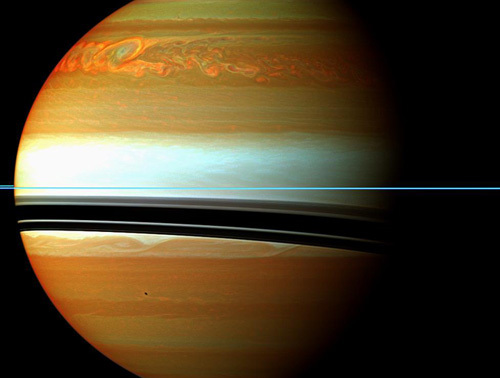 From December 2010 through mid-summer 2011, a giant storm raged in Saturn‘s northern hemisphere. It was clearly visible not only to NASA’s Cassini spacecraft orbiting Saturn, but also astronomers here on Earth—even those watching from their back yards. The storm came as a surprise, since it was about 10 years earlier in Saturn’s seasonal cycle than expected from observations of similar storms in the past. Saturn’s year is about 30 Earth years. Saturn is tilted on its axis (about 27° to Earth’s 23°), causing it to have seasons as Earth does. Go to saturn.jpl.nasa.gov to read about the latest Cassini discoveries. 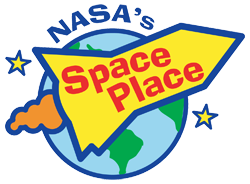 For kids, The space Place has lots of ways to explore Saturn at spaceplace.nasa.gov/search/cassini. Caption: This false-colored Cassini image of Saturn was taken in near-infrared light on January 12, 2011. Red and orange show clouds deep in the atmosphere. Yellow and green are intermediate clouds. White and blue are high clouds and haze. The rings appear as a thin, blue horizontal line.